, dean of Canterbury, a divine of eminent talents and personal worth, was born March 5, 1660, at Hertishorn in the county of Derby. Of this parish his father, the rev. Thomas Stanhope, was rector, as well as vicar of St. Margaret in the town of Leicester, and chaplain to the earls of Chesterfield and Clare. His mother, whose name was Allestree, was of an ancient family in Derbyshire. 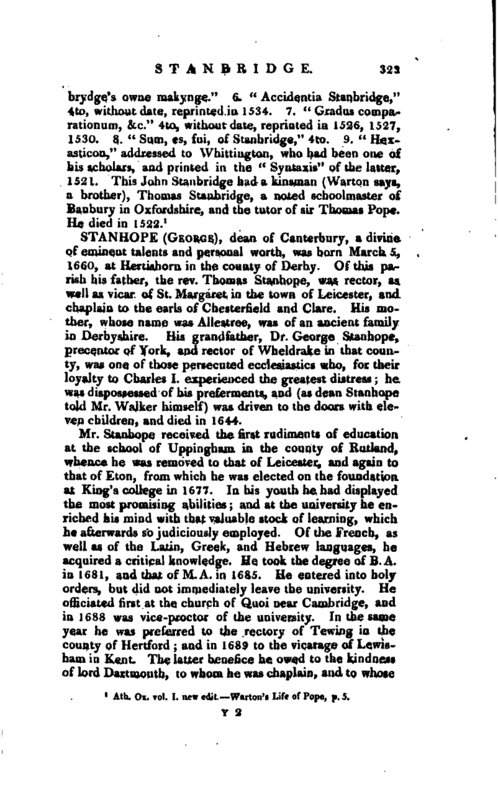 His grandfather, Dr. George Stanhope, precentor of York, and rector of Wheldrake in that county, was one of those persecuted ecclesiastics who, for their loyalty to Charles I. experienced the greatest distress; he was dispossessed of his preferments, and (as dean Stanhope told Mr. Walker himself) was driven to the doors with eleven children, and died in 1644. 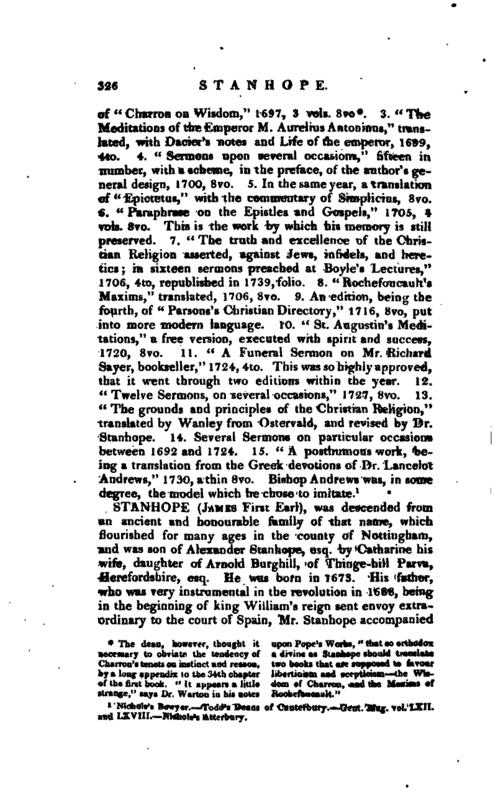 Mr. Stanhope received the first rudiments of education at the school of Uppingham. in the county of Rutland, whence he was removed to that of Leicester, and again to that of Eton, from which he was elected on the foundation at King’s college in 1677. In his youth he had displayed the most promising abilities; and at the university he enriched his mind with that valuable stock of learning, which he afterwards so judiciously employed. Of the French, as well as of the Latin, Greek, and Hebrew languages, he acquired a critical knowledge. He took the degree of B. A. in 1681, and that of M. A. in 1685. He entered into holy orders, but did not immediately leave the university. He officiated first at the church of Quoi near Cambridge, and in 1688 was vice-proctor of the university. In the same year he was preferred to the rectory of Tewing in the county of Hertford; and in 1689 to the vicarage of Lewisham in Kent. The latter benefice he owed to the kindness of lord Dartmouth, to whom he was chaplain, and to whose | son he had been tutor. He was soon after appointed chaplain in ordinary to king William and queen Mary; and he enjoyed the same honour under queen Anne. In July 1697 he took the degree of D. D. the exercises for which he performed publicly, and with great applause. On the preceding Sunday he preached the commencement sermon, in which he stated the perfection, and argued the sufficiency, of Scripture, and gave an eminent display of his eloquence and talents. In 1701 he was appointed preacher at the lecture founded by the hon. Mr. Boyle, when he acquitted himself as an admirable defender of the cause which the benefactor intended to promote, by asserting, in sixteen sermons, the “Truth and Excellency of the Christian Religion against Jews, Infidels, and Heretics.” In 1703, he was presented to the vicarage of Deptford in Kent, on which he relinquished the rectory of Tewing, and held Lewisham and Deptford by dispensation. In this year also he was promoted, on the translation of bishop Hooper to the see of Bath and Wells, to the deanery of Canterbury; in which he was installed March 23, 1704. He was now also Tuesday lecturer at the church of St. Lawrence Jewry; in which appointment, as well as in the deanery, he was no mean successor to Tillotson and Sharp. 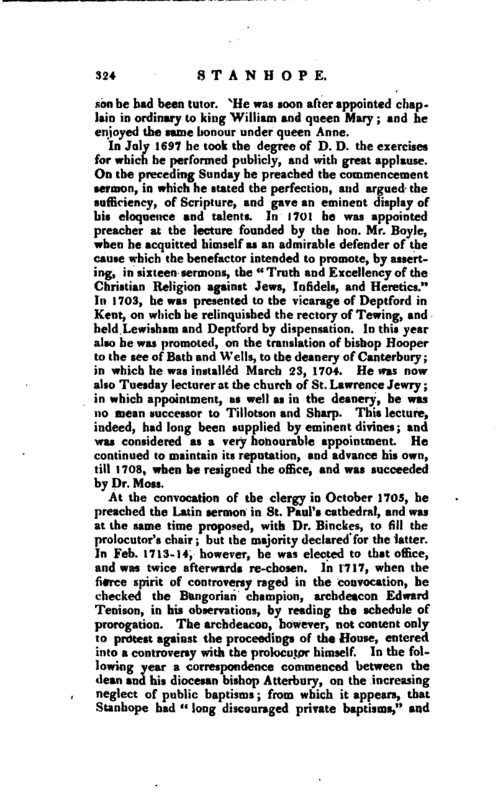 This lecture, indeed, had long been supplied by eminent divines; and was considered as a very honourable appointment. He continued to maintain its reputation, and advance his own, till 1708, when he resigned the office, and was succeeded by Dr, Moss. At the convocation of the clergy in October 1705, he preached the Latin sermon in St. Paul’s cathedral, and was at the same time proposed, with Dr. Binckes, to fill the prolocutor’s chair; but the majority declared for the latter. In Feb. 1713-14, however, he was elected to that office, and was twice afterwards re-chosen. In 1717, when the fierce spirit of controversy raged in the convocation, he checked the Bangorian champion, archdeacon Edward Tenison, in his observations, by reading the schedule of prorogation. The archdeacon, however, not content only to protest against the proceedings of the House, entered into a controversy with the prolocutor himself. In the following year a correspondence commenced between the dean and his diocesan bishop Atterbury, on the increasing neglect of public baptisms; from which it appears, that Stanhope had “long discouraged private baptisms,” and | that the prelate expressed himself obliged to him for his attention in this respect, as also for his constant choice of worthy curates. After having lived an example, even from his youth upwards, of cheerful and unaffected piety, he died, universally lamented, at Bath, March 18, 1728, aged sixty-eight. The mild and friendly temper of dean Stanhope rendered him the delight of all. To the misfortunes of others he was remarkably attentive, and that concern which he expressed, conveyed at once consolation to the heart, and improvement to the understanding. His care as a parish priest, and as a dean, was exemplary. That advice which he gave to others, was the rule of his own practice. In an excellent letter from him to a young clergyman, printed in the Gent. Mag. 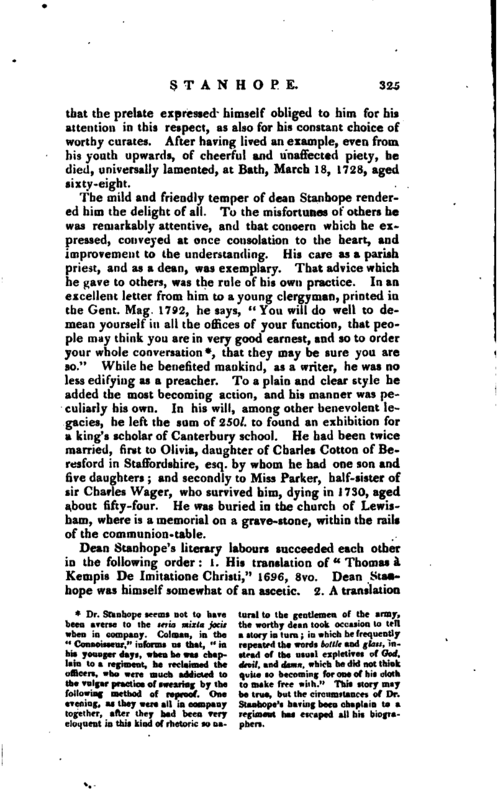 1792, he says, “You will do well to demean yourself in all the offices of your function, that people may think you are in very good earnest, and so to order your whole conversation *, that they may be sure you are so.” While he benefited mankind, as a writer, he was no less edifying as a preacher. To a plain and clear style he added the most becoming action, and his manner was peculiarly his own. In his will, among other benevolent legacies, he left the sum of 250l. to found an exhibition for a king’s scholar of Canterbury school. He had been twice married, first to Olivia, daughter of Charles Cotton of Beresford in Staffordshire, esq. by whom he had one sun and five daughters; and secondly to Miss Parker, half-sister of sir Charles Wager, who survived him, dying in 1730, aged about fifty-four. He was buried in the church of Lewisham, where is a memorial on a grave-stone, within the rails of the communion-table. following method of reproof. One be true, but the circumstances of Dr.
1 Nichols’s Bowyer. Todd’s Deans of Canterbury. —Gent. Mag. vol. LXII. ind LXV III. Nichols’s Atterbury.